Kooltronic has expanded its line of filter fans to include models offering the security of NEMA 4 or 4X Ratings together with the versatility of indoor or outdoor use. All Guardian Series Filter Fans have a NEMA 4 Rating. The GuardianX Series Filter Fans, with a NEMA 4X Rating, are offered with a Stainless Steel Shell. The Guardian/GuardianX Series Indoor/Outdoor Filter Fans are a perfect choice for dissipating high heat loads economically. 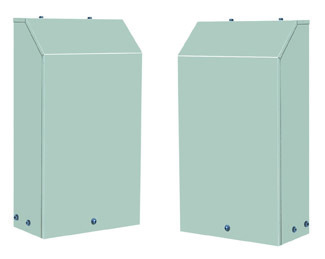 The new Guardian/GuardianX Series Indoor/Outdoor Filter Fans offer the same convenience, versatility and reliability as the Advantage and Sentry Series Filter Fans with the added protection of a NEMA 4 or 4X Rating, making these models an excellent choice for washdown, telecommunications and the food service industry. For general ventilating use only. Do not use these fans to exhaust hazardous or explosive material and vapors. NOT ALL SYSTEMS ARE SUITABLE FOR UTILIZING OUTSIDE AIR. To protect sensitive components against condensation an enclosure heater or closed-loop cooling is recommended. To protect sensitive components against corrosive elements closed-loop cooling is recommended. Filters are stable up to 100°C and 100% rh. (Filters are necessary in order to maintain NEMA 4 or 4X Rating). For applications in corrosive or other hostile environments such as those requiring Internal Corrosion Resisting Coatings, especially where chemical/moisture combinations are present.